In mineralogy a moonstone is name precious adulariaia not only, and yet other less dear semiprecious stone. It is a soft, not jeweller, but carpentry gypsum which is named also Selenite (cinnabar vermilion gypsum). It results in a mess. It has an ebb, little like on lunar also, but other family, than veritable cinnabar Moon stone. Therefore more correct however to name a gypsum selenite, to what always and mineralogists call. Variety of gypsum with a silky ebb. It is a partly translucent gypsum with the trivial-parallel location of layers and expressed irisation. Very soft (scratches a nail). A color is his whitish and rather yellow. Contains inclusion sand, clay, anhydroferrite, grey, organic matter, sometimes in fars. It being afraid of scratches, shots and dissidences of mineral. Often from selenite make round beads or statuettes with the tender natural flowing, different figurines and wares. This stone has a natural tender color usually, it is rarely counterfeited. Restore losing original appearance of wares the repeated polish. 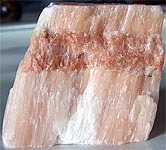 Selenite is name the alabaster of peachy color with an ebb. Easily polished sandpaper. A final lustre is pointed a beeswax. In decorations very quickly loses original appearance. With a cinnabar - toxic poisonous red mercuric sulphide (vermilion, Spanish red). 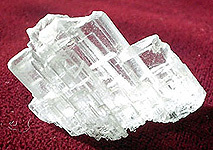 Gypsum (Selenite (gypsum)). Sr. Ural, Russia. 97 mm. Photo: © A.A. Evseev. Pure without admixtures gypsum of CaSO4*2H2O - colourless and transparent (photo down), sulfate of calcium with the molecules of water, there are also crystals of alabaster. 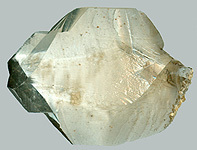 An alabaster is the most hard milky-white variety of gypsum: CaSO4(H2O) 2. An alabaster is easily dyed and polished. 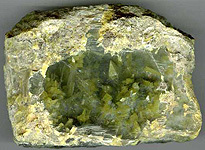 Often be found with the admixtures of other minerals. A greek word "selenium" is meant by a moon. Often Selenite (gypsum) considered a sacred stone. It very soft carpentry stone (scratches a nail). It reacts on full moons, but a color almost always saves the same. Amulet of people which are inclined to develop the intuition: it does not allow them to fall in euphoria, pacifies their displays. 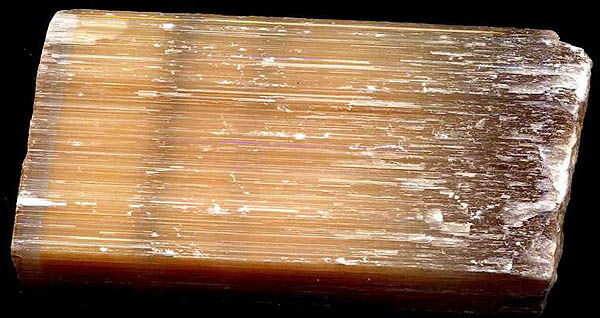 Selenite (gypsum) - perfectly combines in itself all of guard qualities for women and as a talisman does their penetrating and enigmatic. Selenite (gypsum) - sacred stone women-priestesses, guards loyalty and devotion, cleanness and blamelessness. Contemplation of selenite (a cinnabar, vermilion, Spanish red) calms a psyche.